Understanding the role of proteins, peptides, and their post-translational modifications in the metabolism of healthy and diseased tissue is crucial to elucidate biological mechanisms, identify potential drug targets, or define disease biomarkers. Yet biological change begins from the moment a tissue sample is removed from its native environment. This disruption of normal control mechanisms causes drastic alterations at the molecular level. This is manifested by alterations in phosphorylation states, the breakdown of proteins due to uncontrolled proteolytic activity, and changes to metabolite levels. In short, sample quality deteriorates rapidly, and vital information about the in vivo components may be lost or distorted. With such a reduction in sample quality, the risks of inter-sample variation, incorrect data interpretation, and drawing misleading conclusions increase substantially. These post-mortem biological changes present an analytical challenge and must be prevented to ensure reliable, high-quality data. Scientists at Denator have developed a heat-stabilization technology that utilizes conductive heating, under controlled pressure, to rapidly and irreversibly denature the proteins in a tissue sample. The complete and permanent elimination of enzymatic activity that would otherwise cause biological change preserves the original composition and state of proteins, peptides, and post-translational modifications. This increases the accuracy and quality of analytical results. After heat stabilization, of either fresh or frozen tissue samples, in a Stabilizor system, biological components can be extracted and analyzed using common buffers and techniques. It has been demonstrated that kinase and phosphatase activities, critical in the control of phosphorylation states, are eliminated in heat-stabilized tissue. A comparison with snap-frozen samples showed phosphatase activity in heat-stabilized samples equivalent to background assay levels. Even in the presence of inhibitors, snap-frozen samples contained significantly higher enzyme activity. A study at Harvard Medical School demonstrated that heat stabilization abolished 99.6% of kinase activity that would otherwise cause further biological changes (Figure 1). Conventional approaches to reducing and inhibiting biological change post-excision include the use of snap freezing, inhibitor cocktails, pH changes, or cross-linking. These measures may suppress and reduce enzymatic activity, but they do not permanently eliminate the original problem since enzymatic activity can resume when temperature is raised during sample handling or when inhibitors are lost during sample processing. Residual enzymatic activity can also be present due to incomplete inhibition. Inhibitors may also interfere with downstream analytical techniques or pose a health and environmental hazard. Figure 1. Heat stabilization abolished 99.6% of kinase activity. The ability to determine phosphorylation states that reflect the in vivo status as closely as possible is crucial to understanding the role of phosphoproteins. This is of particular interest for diseases such as cancer, neurodegeneration, and atherosclerosis, but also in disease prognosis and in determining the action of a potential therapeutic. Confirmation that phosphorylation states can be preserved by heat stabilization is found in a comparison between heat stabilization and conventional snap freezing of hippocampal lysates. Phosphorylation states continued to change in snap-frozen samples left for 30 min at room temperature, but remained constant in heat-stabilized samples under the same conditions (Figure 2). Phospho-shotgun analysis (affinity extraction of phosphorylated digested peptides followed by mass spectrometric analysis) has not often been utilized for analyzing tissue samples due to major concerns about post-sampling changes during the subsequent analytical workflow. However, in a study by Professor Jesper Olsen’s research group at the Center for Protein Research, Novo Nordisk Foundation, heat stabilization has been incorporated into their phospho-shotgun workflow as an initial step to control these post-sampling changes. This has enabled compilation of the widest tissue catalog of phospho-proteins published to date, covering 31,480 phosphorylation sites on 7,280 proteins quantified across 14 different rat organs and tissues. The use of heat stabilization to preserve sample quality and in vivo-like levels of post-translational modifications increases the relevance of these results for biological interpretation. Figure 2. Phosphorylation states remain constant in heat-stabilized samples. Statistical significance determined by unpaired Student’s t-test. Detecting and determining the role of endogenous peptides presents a particular challenge as the post-mortem proteolytic activity produces protein fragments (peptides) that may mask many endogenous peptides that are present at low levels. When compared with snap-frozen samples, scientists at CSIRO Livestock Industries (Australia) were able to reveal a greater number of neuropeptides in bovine hypothalamus tissue by using heat stabilization. Degradation products of protein stathmin (stathmin [2–20] and stathmin [2–22] peptide fragments) were prominent in the snap-frozen samples. 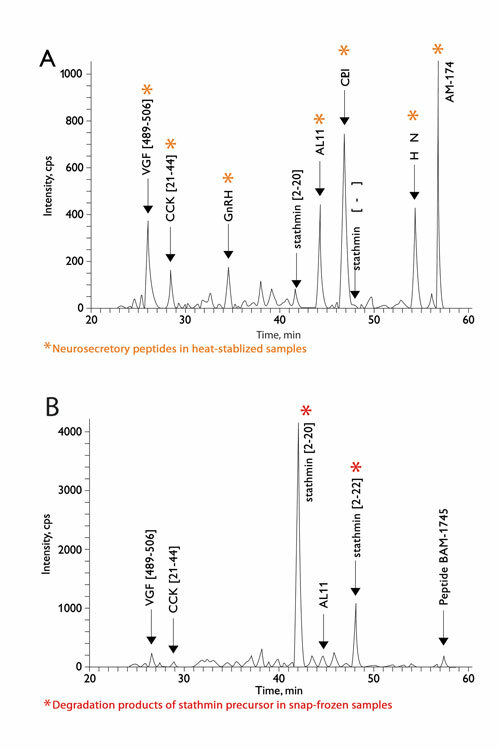 Their results, using LC-MS (Figure 3), clearly demonstrate how heat stabilization enables the detection of more, potentially novel, endogenous peptides by preventing post-mortem proteolytic degradation. A recent development is the usage of MALDI imaging as an analytical technique for mapping in situ distribution of pharmaceuticals, metabolites, and peptides on thin tissue sections. However, the technique suffers from changes in analyte levels caused by residual enzymatic activity throughout the analytical process. In a study by Richard Goodwin (AstraZeneca and Uppsala University), the Stabilizor system was introduced in the workflow to stop such post-sampling changes. The intact endogenous neuropeptide Pep-19 were found at higher distribution levels in heat-stabilized samples compared to snap-frozen samples. 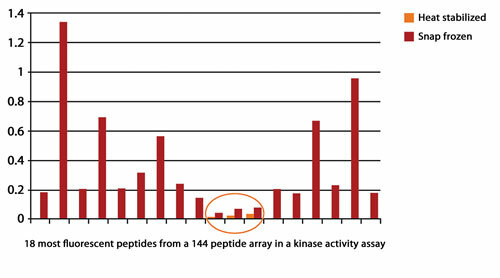 Additionally, degradation fragments from the same peptide were exclusively found in snap-frozen samples. This shows that incorporating the Stabilizor system will result in biologically relevant images of analyte distribution in tissue organs. Figure 3. Neuropeptide profiling of the bovine hypothalamus: LC-MS profile: neurosecretory peptides VGF[489–506], CCK[21–44], GnRH, AL11, CLIP, HCNP, and BAM-1745 detected in heat-stabilized samples (A) are diminished in snap-frozen samples (B). Degradation products of stathmin precursor (stathmin [2–20] and stathmin [2–22]) seen only in snap-frozen samples. Heat stabilization has helped to reveal in vivo profiles and to identify novel biological molecules that would previously have been lost due to rapid degradation. Such information is of particular significance in areas such as neuroscience and proteomics research where short-lived molecules and potential biomarkers need to be confidently identified to elucidate disease mechanisms and identify potential drug targets or disease markers. Compatibility with a number of downstream analytical techniques has been verified, including mass spectrometry, phospho-shot gun, MALDI imaging, Western blot with phospho-specific antibodies, 1D and 2D gels with phospho-specific stains, and reversed-phased protein arrays. Marcus Söderquist, Ph.D. (marcus@denator.com), is senior scientist at Denator.